ExtHashJoin is a general purpose joiner. It merges potentially unsorted data from two or more data sources on a common key. The component is fast as it is processed in memory. ExtHashJoin receives data through two or more input ports, each of which may have a different metadata structure. The joined data is then sent to the single output port. ExtHashJoin propagates metadata from the first input port to the second output port and from the second output port to the first input port. ExtHashJoin has no metadata templates. A key according to which incoming data flows are joined. See Join key. Transform  A transformation in CTL or Java defined in a graph. Transform URL  An external file defining the transformation in CTL or Java. If set to true, records with duplicate key values are allowed. If false, only the first record is used for join. Encoding of an external file defining the transformation. An initial size of a hash table that should be used when joining data flows. If there are more records that should be joined, the hash table can be rehashed; however, it slows down the parsing process. The lowest possible value is 512; if a value lower than 512 is defined, 512 is used instead. The number denotes the number or record. For more information, see Hash Tables. A definition of the action that should be performed when the specified transformation returns an Error code. See Return Values of Transformations. A URL of the file to which error messages for specified Error actions should be written. If not set, they are written to Console. If set to true, left outer join is performed. By default, the attribute is set to false. However, this attribute has a lower priority than Join type. If you set both, only Join type will be applied. If set to true, full outer join is performed. By default, the attribute is set to false. However, this attribute has a lower priority than Join type. If you set both, only Join type will be applied. For more information, see CTL Scripting Specificsor Java Interfaces. ExtHashJoin reads records from slave ports and stores them into hash tables. The records from the hash tables are employed for mapping with the records from the master. The data attached to the first input port is called the master (as usual in other Joiners). All remaining connected input ports are called slaves. Each master record is matched to all slave records on one or more fields known as the join key. An output is produced after applying a transformation that maps joined inputs to the output. For details, see Joining Mechanics. This joiner should be avoided in the case of large inputs on the slave port. The reason is that slave data is cached in the main memory. If you have larger data, consider using the ExtMergeJoin component. If your data sources are unsorted, use a sorting component first (ExtSort, FastSort or SortWithinGroups). The Join key is a key according to which the incoming data flows are joined. It is specified as a sequence of mapping expressions for all slaves. The mapping expressions are separated from each other by hash. Each of these mapping expressions is a sequence of field names from master and slave records (in this order) put together using an equal sign and separated from each other by a semicolon, colon, or pipe. The order of these mappings must correspond to the order of the slave input ports. If some of these mappings are empty or missing for some of the slave input ports, the mapping of the first slave input port is used instead. Different slaves can be joined with the master using different master fields! If some $slave_fieldJ is missing (i.e. if the subexpression looks like this: $master_fieldJ=), it is supposed to be the same as the $master_fieldJ. If some $master_fieldK is missing, $master_fieldK from the first port is used. $last_name (because it is the field which is joined with the $lname for the first slave data source), $salary and $hire_date. To create the Join key attribute, use the Join key dialog. When you click the Join key attribute row, a button appears in this row. By clicking this button, you open the dialog. In the dialog, you can see tabs for all of the slave input ports. In each slave tab, there are two panes: Slave fields and Key mappings. The Slave fields pane is on the left. It contains a list of all the slave field names and their data types. The Key mapping pane is on the right. It contains three columns: Master fields, Master field type and Slave key field mapped. The left column contains all field names of the driver input port. The middle column contains data types corresponding to the fields in the first column. The right column contains the mapped fields from the slave fields tab. 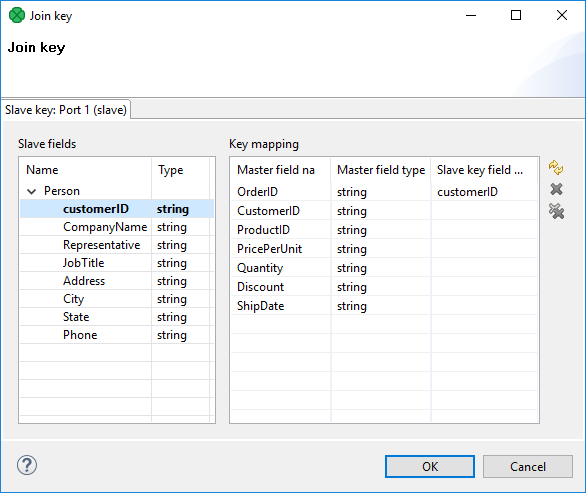 To map a slave field to a driver (master) field, drag the desired slave field from the left pane, and drop it into the Slave key field mapped column in the right pane. The mapping will be created. Repeat for all slave fields to be mapped. The same process must be repeated for all slave tabs. Note that you can also use the Auto mapping button or other buttons in each tab. Thus, slave fields are mapped to driver (Master) fields according to their names. Note that different slaves can map different number of slave fields to different number of driver (Master) fields. The component first receives the records incoming through the slave input ports, reads them and creates hash tables from these records. For every slave input port one hash table is created. After that, the component looks up the corresponding records in these hash tables for each driver record incoming through the driver input port. If such record(s) are found, the tuple of the driver record and the slave record(s) from the hash tables are sent to a transformation class. The transform method is called for each tuple of the master and its corresponding slave records. The hash tables must be sufficiently small to fit into the main memory. The incoming records do not need to be sorted. If the table is 75% full, the size is doubled and the table is recalculated. The real size of the hash table is nearest power of 2 greater than or equal to the defined parameter value. The initialization of hash tables is time consuming, therefore it may be a good idea to specify how many records will be stored in hash tables. If you decide to specify the Hash table size attribute, it is wise to consider these facts and set it to the value greater than needed. Nevertheless, for small sets of records, it is not necessary to change the default value. All slave input data is stored in the memory. However, the master data is not. As for memory requirements, you therefore need to consider only the size of your slave data. In consequence, be sure to always set the larger data to the master and smaller inputs as slaves. ExtHashJoin uses in-memory hash tables for storing slave records. Remember that each slave port can be joined with master using different numbers of various master fields. A transformation in ExtHashJoin is required. A transformation in ExtHashJoin lets you define the transformation that sends records to the first output port. Unjoined master records sent to the second output cannot be modified within the ExtHashJoin transformation. The mapping of unmatched records to the second (optional) port is performed without being explicitly specified. For detailed information about CloverDX Transformation Language, see Part X, CTL2 - CloverDX Transformation Language. The master port contains metadata fields ProductID and Color. The color is in the RGB code. The slave port contains RGB values and the corresponding color names. Match the product with corresponding color name. The Product_C is missing as it does not match any record with RGB color. If you need to send products with no corresponding color to the output, set Join type to Left outer join. The items without a match will have a null value instead of the color. If the transformation is specified in an external file (with Transforms URL), we recommend users to explicitly specify Transform source charset. ExtHashJoin now has a second output port. Metadata propagation has been affected as well.